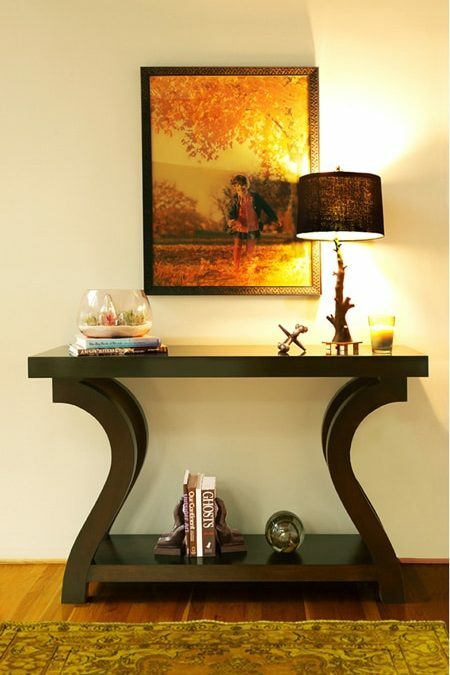 Good feng shui begins with balance, intention and in our case, beauty and style. 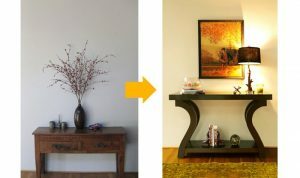 Each detail in this feng shui alter (after photo above) was carefully thought out, from understanding the 5 natural elements represented, to the position of the table and objects. When we design an alter, we set it up to impact our clients on an emotional basis. Each alter holds items that are special to them on a personal basis, whether it be to honor someone who has passed away, bring focus to a creative career goal or become a symbol for their spiritual path. In this case our after photo shows an alter that is meaningful to my clients as it depicts someone very special that they wanted to honor. I placed the coral Moth Design lamp there to both guide the energy as you walk in from a feng shui stand point and add light to the special photograph above the table. The plants in the glass terrarium are a Qi (energy) activator and the candle is a ceremonious touch good for any alter. The metal jacks add a playful quality, the prayer posed hands are in the position of honor, and the crystal ball adds a mysteriously profound aspect. In feng shui we want to balance the natural elements. There are many ways to do this. In this case, I chose to represent each of the 5 natural elements of metal, wood, water, fire, and earth. I designed the table to represent the natural elements of metal because of the round arch like shape. It also represents wood as it is literally made of wood. Items can represent more than one element at the same time. The reflective glass and crystal ball represent water. The lamp, candle and firey colors in the art work represent fire. The mountain shape in the terrarium represents earth. Join our creative community – sign up for our mailing list. Stay in touch with us. We would love to hear from you and are always available to answer any questions. Please send us any great new finds that you want to share or let us know about your own fabulous work. Book a virtual or Los Angeles Interior Design or Feng Shui consultation to see how we can use all these innovative ideas on your project! Take a feng shui class to delve deeper into the subject. Kim teaches beginner and certification feng shui classes through the Shambhalla Institute based in LA & Orlando. Follow us on instagram, pinterest, facebook and houzz. © 1991-2018 Shambhalla Institute™ | All Rights Reserved.